The ASCO Series 300L Power Transfer Load Center has everything that is needed to protect sensitive loads from power outages and transients in one package: World-class ASCO Series 300 Automatic Power Transfer Switch with microprocessor digital controller, versatile Square D Load Distribution Panel, and protective transient voltage surge suppression for normal and emergency operation. It is available in 200 or 400 amp rating, 120/240 VAC 60 Hz single phase, 3 wire or 120/208 VAC, 60 Hz three phase, 4 wire. 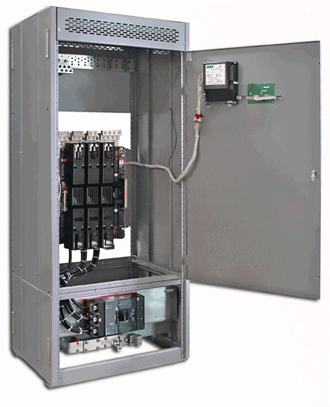 The ASCO Series 300L Power Transfer Load Center includes a 42-position load distribution panel. When power fails, the UL 1008 listed automatic transfer switch follows user-set time delays to start the generator, transfer the load to the generator, reconnect to utility power and shut down the generator after generator cool down. 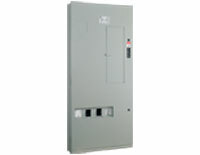 Power Transfer Load Center is Service Entrance Rated and listed to UL 67. Automatic Transfer Switch is listed to UL 1008, the standard for Transfer Switch Equipment, and meets NFPA 110 for Emergency and Standby Power Systems and the National Electrical Code (NEC) articles 700, 701 and 702. Also CSA certified to CSA 22.2 No. 178-1978. Adjustable close differential voltage sensing on the normal source Available in Type 1 (indoor) or Type 3R (outdoor) enclosures. Automatic engine exerciser to test the generator with or without loads. Pre-wired and factory tested for easy installation. Space saving modular design provides easy access and serviceability. Convenient terminals for connecting neutral and ground conductors. True double-throw contacts eliminate simultaneous connection to utility and generator. 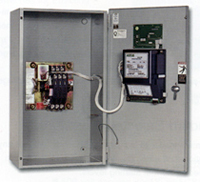 Main circuit breakers provide over-current protection and disconnect for convenient and safe serviceability.